Musician Daniel Burdick walked away from his big break to save his ex-girlfriend's life. His sacrifice has opened doors that, until now, existed only in his dreams. PETALUMA, Calif. (KGO) -- Daniel Burdick a musician with a dream who walked away from his big break to save his ex-girlfriend. In a follow-up to ABC7 News' story last month, one man's sacrifice has opened doors that, until now, existed only in his dreams. Burdick and his ex-girlfriend Sabrina Timms broke up years ago because Burdick wanted to pursue his music career. Then, when Timms learned she needed a new kidney, Burdick abandoned a tour that might have changed his career in order to save her life. The sacrifice wasn't easy for Burdick. "It was the biggest moment in my dreams so far and I've been doing it for 13 years," he said. Six weeks later, the perfect match became the perfect transplant. "You can give blood, you can donate life. Because of him, he saved my life. He's giving me my life back," Timms said. Sabrina Timms needed a kidney transplant and of all the donors in the world, her ex-boyfriend Daniel Burdick turned out to be a perfect match. They broke up years ago because he wanted to pursue his music career. Then, ironically, to ease Sabrina's pain, Daniel abandoned a tour that might have changed his career. Timms is now back at home with their daughter, Hope, and will return to work next month. But what about the music tour Burdick sacrificed? After 13 years of struggling to gain traction in his music career, the rapping and singing blues artist is doing better than ever. A radio station saw the story, wanted to play Burdick's music and contacted ABC7 News to make the connection. A music producer also offered to help, plus the owner of a small recording studio. Burdick's music career now has more potential than if he went on that tour. "Well, it seems I've been paid back tenfold," Burdick said. Breaks don't just happen, they're made -- sometimes in the most roundabout of ways. "Something good happens, you know, out of something bad," Burdick said. 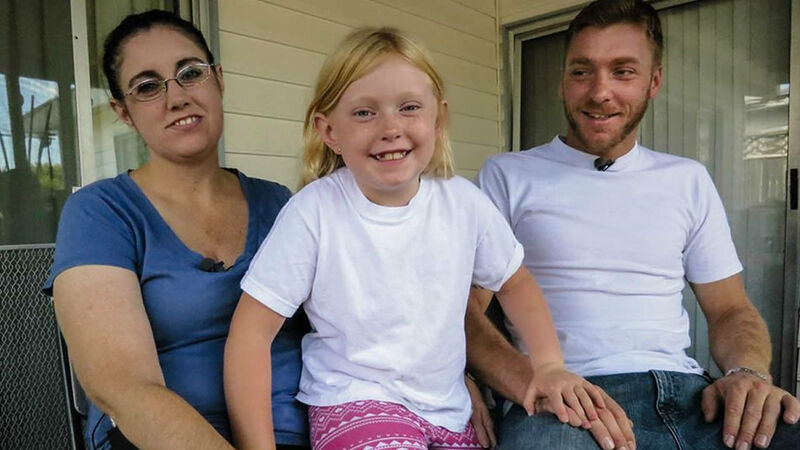 It appears to be a happy ending for the man and woman who named their daughter Hope.